Dear Readers, while I was walking in the Playing Fields at the edge of Coldfall Wood a few weeks ago, I saw a plant that I didn’t recognise. This in itself is not so strange – of the plants that surround me, I know only a tiny fraction, though my knowledge is improving all the time. But this plant looked like a member of the pea family, but grew like a bush. It was all on its own, and had delicate mauve flowers. How had I missed it before? ‘A Sheffield miner told me that he remembered his father recounting how in the early part of this century horticultural traders used to work the poorer parts of the city suburbs selling garden plants which only just merited that description. They were aggressive species like tansy, Michaelmas daisy, feverfew and goat’s rue, all of which have naturalised widely in the city. He recalled his father purchasing Japanese knotweed and how friends were invited round to marvel at the spotted stem and attactive foliage and how the plant was later divided up for exchange’. 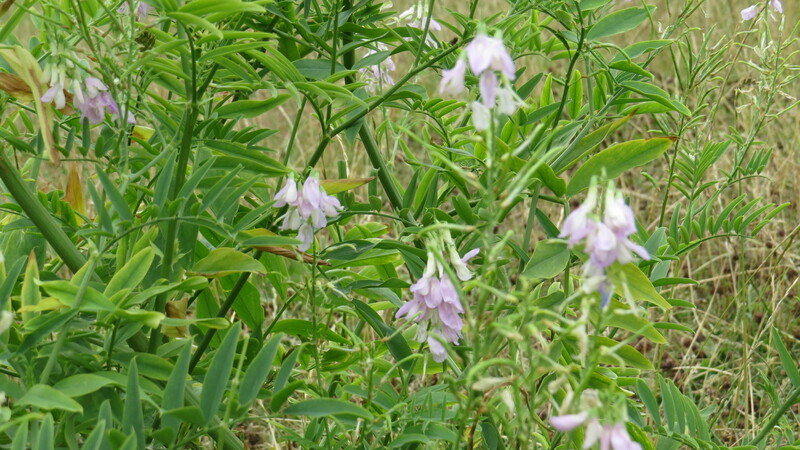 However, as I have started to delve into the history of Goat’s Rue, I have come to realise that this is no ‘ordinary’ weed. In fact, I’m starting to think that there is no such thing as an ‘ordinary’ weed, but this one is extraordinary. It’s Latin name, Galega, means ‘to bring on milk’, and it was used to increase milk supply in a variety of domestic animals, hence its common name. Nursing human mothers have also used the herb for this purpose, and a quick look on the internet shows that supplements containing this plant are available, along with recommendations for dosage using the whole plant. Personally, I would be extremely careful about using any plant that is known to have toxic effects (see below). This is not the only way that Goat’s Rue has been used. It has been used as a worm treatment for domestic animals, and also to treat plague victims. In the first case, I can imagine that its toxicity was a way of killing the parasites, providing the dosage was managed properly and didn’t kill the animal as well. As to the poor plague victim, I suppose that death by poisoning was the least of their worries. 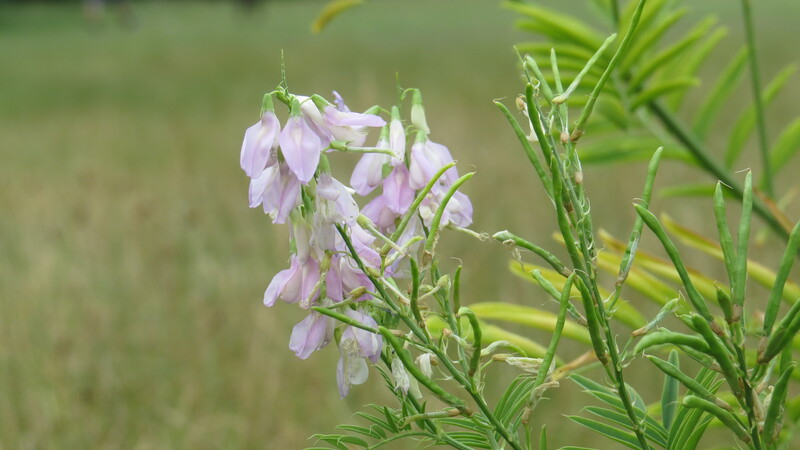 The name ‘Goat’s Rue’ has been explained as either the result of its use to encourage milk production, or because of the unpleasant smell of its bruised leaves. I don’t find either of these ideas particularly conducive – I’d have thought that a goat would be happy to be producing more milk for its kids (though admittedly not if it was stolen to feed humans), and the leaves don’t smell particularly goaty to me. But there we go. The reasons are lost in the proverbial mists of time. The North American nickname for the plant, Professor Weed, is said to be because it was originally introduced as a forage weed by the professorial body at the Utah Agricultural Experiment Station. Not only was it found to be less toothsome to the grazing animals than alfalfa, but it also ‘went native’ with a vengeance, hopping over the fence and spreading all over those wide open spaces. When a report that it had killed some sheep in Europe came in, an eradication programme which removed over 90% of the plant took place. Since then, it has bounced back, and the battle goes on. 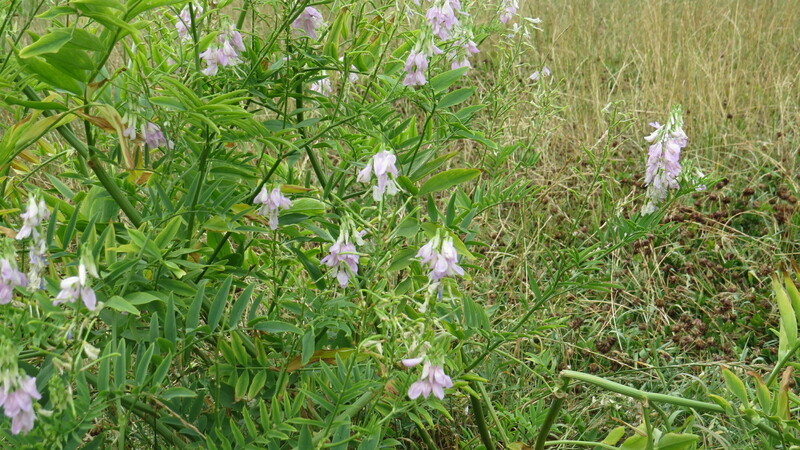 Goat’s Rue has also been used as a replacement for rennet during cheese-making (and in fact yet another alternative name for the plant in the north of England is ‘Cheese-Rennet’). It is said to be useful if you are bitten by a snake. And, in experiments that no doubt resulted in the deaths of hundreds of mice, it has been shown to reduce obesity. Was there ever a poisonous plant with so many uses? And, furthermore, so many names? 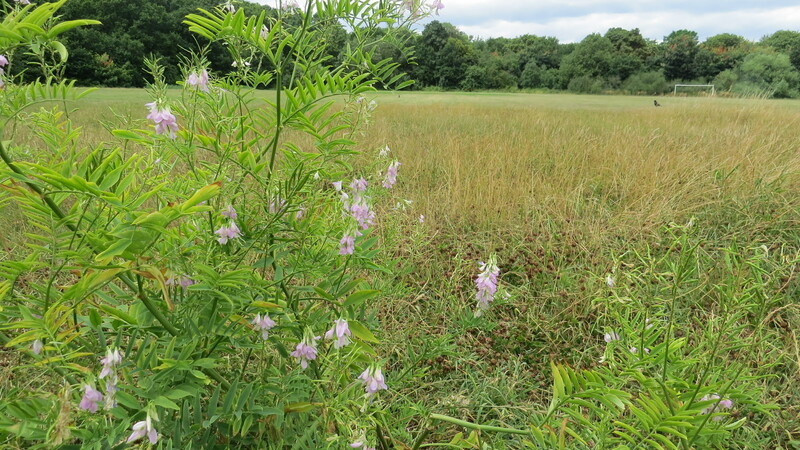 In German folklore, Goat’s Rue is known as one of the Holy Hay plants, along with Sanfoin and Alfalfa. This is because it was said to be one of the plants laid in the manger in Bethlehem. When Jesus was laid down amongst the hay, it is said to have spontaneously burst into flower. And, whatever your religion, what a lovely image this is to end with. This entry was posted in London Plants on August 12, 2015 by Bug Woman. What an amazing plant. I will definitely keep a look out for this one and marvel at it. Thank you. It is a wonderful plant, and one I knew absolutely nothing about until it popped up. As both my mum and dad and my brother are diabetic, I was profoundly grateful to it…. Very interesting! I’ve seen that plant around but never guessed it had such a back story. Goat’s-rue also is also associated with some insects, most notably the seed beetles Bruchidius imbricornis and Bruchdius varius. B. imbricornis is a fairly new arrival to the UK with the first report of it from Essex during 2012 by entomologist Peter Hodge. The males are distinctive by having bright orange antennae. This year I was visiting the grounds of Alexandra Palace and sweep-netted quite a few off some goat’s rue plants there so it seems to be spreading. 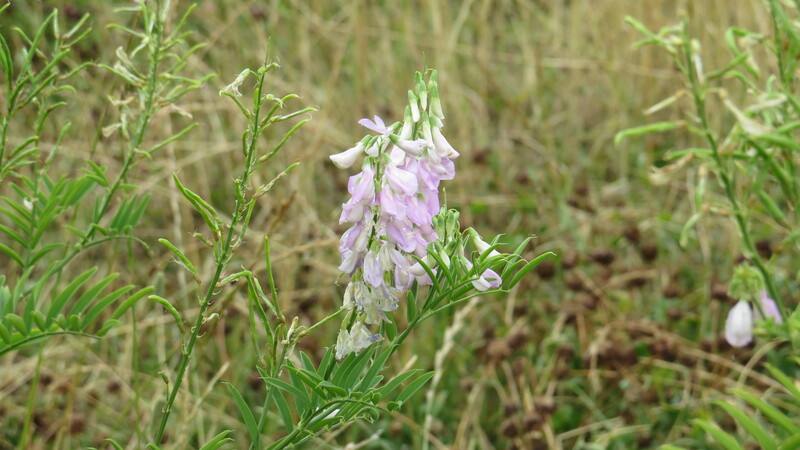 In the next few years it could be expected to colonise as far north as South and West Yorkshire where goat’s rue is to be found in abundance in many places. Thanks, Jim – I shall keep an eye open for the seed beetles next year. The orange antennae sound most intriguing….